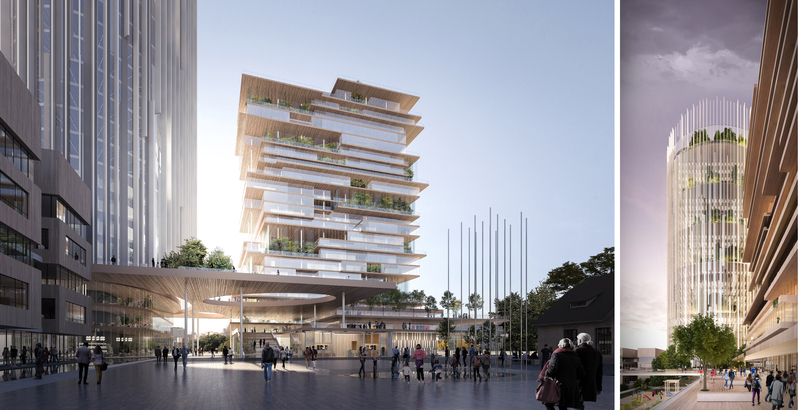 Transsolar collaborated with Mario Cucinella Architects on a new vision for one of Viennas most iconic neighborhoods, the Prater in Vienna’s “Viertel Zwei.” The mixed-use, 100,000 m² (1,076,391 ft²) development in direct proximity to the park will be car-free and feature two towers (90 and 120 meters high respectively) for residential and commercial use, including office spaces and a hotel. The focus of Transsolar’s comfort concept is south facing winter gardens to be used by residents and to enhance natural ventilation. The taller tower will be naturally ventilated via a central shaft supplying fresh air into the floor areas while also exhausting air with the stack effect, reducing the necessary fan power.